We sell cloisonne enamel pigments manufactured by Ninomiya Color Shippo Co., Ltd. (Flower Vase Brand). Sorry names of the colours are in Japanese only. a. The enamel colours P and NG are fired on the base on which N-2 was fired first. b. 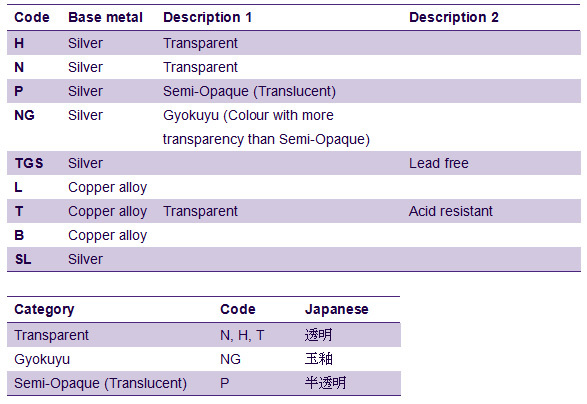 The base metal of the enamels marked [〇] is silver. c. The base metal of the enamels without mark is copper alloy (95% copper + 5% zinc). 3) Burning temperature is 800 - 900 degrees Celsius. 4) It is preferable to burn red transparent enamel at high temperature. 5) Actual colours may vary slightly from the colour on your screen due to monitor restrictions. You can check the unit prices of enamel pigments in the following price lists. Sale and processing of copper alloy material, etc. Pin's parts, tie clips, cuff buttons, processed goods by order, brooch clips, etc. 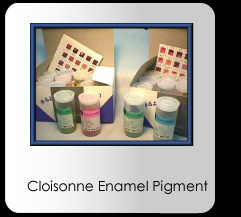 Shippo (cloisonne) enamels, different types of silver solder flux, etc. Copyright © 2009 KANAYASU Inc. All Rights Reserved.